Handing over: Andy Murray and Kyle Edmund. KYLE EDMUND led the tributes to his “biggest role model” after Andy Murray announced his intention to retire. 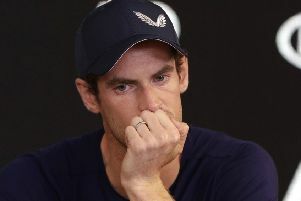 At a tearful press conference ahead of the Australian Open, the Scot laid bare the effects of the pain in his right hip that has dogged him for more than 18 months. 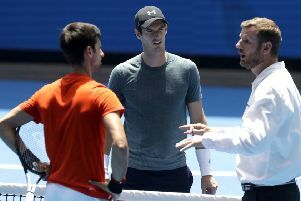 Murray has played a mentoring role with a number of British players but none more significant than Yorkshire’s Edmund, who overtook him as the country’s leading player after reaching the semi-finals here 12 months ago. Beverley’s Edmund said: “For me, he’s been my biggest role model out of any tennis player. He’s Britain’s greatest tennis player ever and you could say maybe Britain’s best sportsman ever. Murray’s support for women and the women’s game was also appreciated by British No 1 Konta, who said: “There have been so many examples of when he has stood up for us - not just for women’s tennis but women in general. “His sense of humour at times is so weird but I enjoy it. We just recently had dinner in Brisbane. He’s overall a great guy, great competitor, loves the sport, gave so much to the sport and proved that with hard work everything is possible.